My, oh my…oh my. This past weekend has been s-t-r-e-s-s-f-u-l to say the least. This whole “nursing school is just around the corner and I still have a billion things to get done” thing is definitely leaving me feeling short of defeated most days. Howeverrrrr.. it’s all worth it and quite frankly, I wouldn’t change the stressful days and sleepless nights for the world. I’m one step closer to pursuing my dream career and I’m PUMPED. Between getting what seems like endless vaccinations (ouch) to memorizing thousands (maybe over-exaggerating a little) of medical terminology words, I’m surprisingly still finding time tend to my taste buds. Growing up in England, one of my favorite memories was coming home from school to the mesmerizing smell of garlic butter oozing through the house. I always knew that it only meant one thing. Mom was making chicken kievs and it pretty much just clarified that she loved us. This recipe isn’t exactly the same as a chicken kiev but it utilizes the best parts of the recipe, then throws in some added ingredients to make it that much better. I decided to add sun-dried tomatoes to really kick up the flavor and substituted the butter for lite vegetable oil spread. The traditional kiev recipe usually requires that you fry the chicken prior to baking in order to get the flour layer extra crispy. I found that substituting the flour with panko breadcrumbs allows us to not only reduce those calories, but also still have that deliciously crispy crust without the need of a frying pan! In a small bowl, combine the vegetable oil spread with the chopped parsley and garlic and transfer to cling wrap and spread out into a log. Tightly seal and freeze for 45 minutes or until solid. Preheat oven to 375 degrees F. Using a meat tenderizer, flatten each chicken breast half until about 1/2 inch thick. Cut garlic butter mixture into 4 equal pieces and place one piece in the center of each chicken breast half. Add a few pieces of sun dried tomato gently fold the ends of the chicken breast, sealing the mixture in the center. Using toothpicks, seal around the edges to ensure there are no gaps. In a small bowl, whisk the egg and in a separate bowl, combine the breadcrumbs, garlic powder and salt. Carefully dip each chicken into the egg and then into the breadcrumb mixture. Place onto a baking pan lined with foil and bake for 20-25 minutes or until the centers are no longer pink. Allow chicken to cool for approx 5 minutes and remove toothpicks before serving. 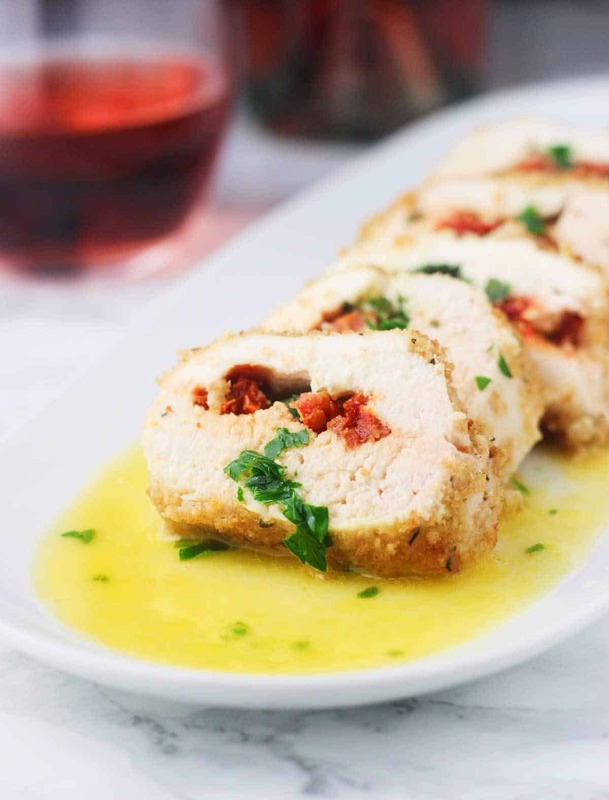 Deliciously juicy chicken breasts, coated in panko breadcrumbs and stuffed with a sun dried tomato, garlic butter mixture! Oh my word! These look perfect and healthy! Gotta try them soon. This looks like the perfect dish! Yum!